Open systems are normally used for pneumatic conveying, particularly when conveying in air. Closed systems can be employed only for very specific circumstances (toxic and explosive materials). 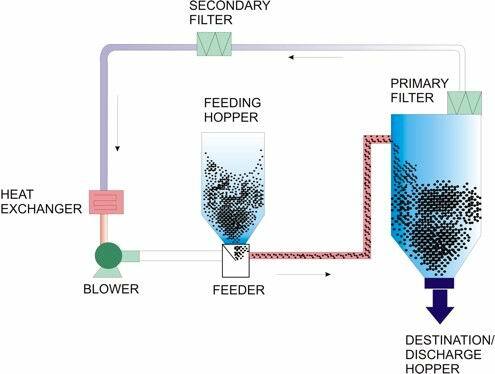 Materials usually can be blown as well as sucked and so either vacuum or pressure can be employed for pneumatic conveying. The majority of pneumatic conveying systems are in fixed locations and so this is not identified as a particular case. A variety of mobile systems are available for specific duties. Pneumatic conveying systems represent a suitable solution for the transport of powdered and granular materials in industrial plant and factories. a receiver system to disengage and separate the conveyed material from the carrier gas. The entire system can work without moving parts coming into contact with the conveyed material, an important feature in food processing. A vast range of food products like flour, sugar, tea, coffee can transported as granular material or powders. Harvested materials in agriculture such as grain and rice, as well as processed materials like animal feed pellets are transported using pneumatic conveying systems. Food and chemical products tend to be considered problematic materials in both the design and operation of pneumatic conveying systems more than other materials. They can exhibit an extremely wide range of conveying characteristics, with variable performance during conveying. These materials tend to be present in several forms, from fine powders to granules or pellets, and the conveying performance of each one can differ widely. 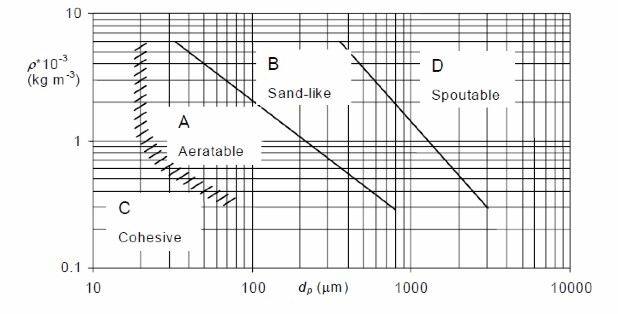 As the same material can be present in different forms and grades and the performance of each can be strongly variable, the type of a material alone is not enough to define the conveying properties. Group B powders, called ’sandlike’ particles or bubbly particles. Most particles of this group have size 150 μm to 500 μm and density from 1.4 to 4 g/cm3. For these particles, once the minimum fluidization velocity is exceeded, the excess gas appears in the form of bubbles. Group D powders , called ’spoutable’ , the materials are either very large or very dense. Unlike group B particles, as velocity increases, a jet can be formed in the bed and material may then be blown out with the jet in a spouting motion. Spouting behavior and severe channeling can be expected, if the gas distribution is uneven. Diagram of the Geldart classification of particles (Geldart, 1973). Two modes of conveying are defined for continuous conveying and for batch conveying if the batch size is large enough. 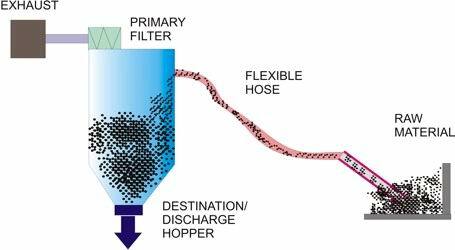 Dilute phase conveying if the material is conveyed in suspension in the air through the pipeline. Dense phase conveying if the material is conveyed at low velocity in a non-suspension mode through all or part of the pipeline. Almost any material can be conveyed through a pipeline in dilute phase regardless of the particle size, shape or density. This is often referred to as suspension flow because the particles are mostly held in suspension in the air as they are blown or sucked through the pipeline. As a relatively high velocity is required, power requirements can also be high, but there is virtually no limit to the range of materials that can be conveyed. low pressure drops per unit length of transport line ( less than 5 mbar/m). In the presence of dilute flow conditions fluid-particle aerodynamic forces dominate and the solid particles behave as individuals particle fully suspended in the gas. Dilute phase pneumatic transport is limited to continuous short transport distance of solids at rates of less than 10 t per hour and it is the only system capable of operating under negative pressure. the other mode is slug or plug type flow, in which the material is conveyed as full bore plugs separated by air gaps. In a conventional conveying system, moving bed flow is only possible if the material to be conveyed has good air retention characteristics (good blockage), while plug type flow is possible if the material has good permeability. Dense phase flow is characterized by lower gas velocities (1 to 5 m/s), high solids concentrations (greater than 30% in volume) and high pressure drops per unit length of pipe ( greater than 20 mbar/m). In dense phase transport particles are not fully suspended and a strong interaction between the particles is present.